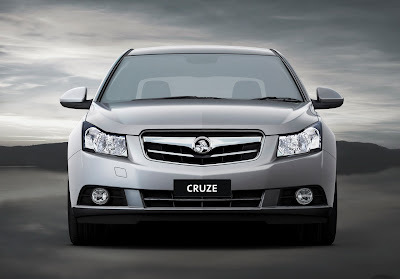 MELBOURNE : September 27, 2009 - The all-new Holden Cruze made its Australian debut at the Melbourne International Motor Show today signalling the company’s latest entrant in the competitive small car segment. 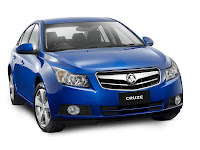 With a wide track, long wheelbase and its wheels located at the outer edges of its body, the Holden Cruze sedan’s 'four-door coupe' styling delivers the presence of an upscale mid-size sedan. “Vincero! Vincero! – I will win“, that is the self-confident exclamation from Nessun Dorma, probably the most famous tenor aria from Giacomo Puccinis opera Turandot. And Vincero is also the name of the latest automobile accessory line by refining specialist Mansory. Mansory already finds many parallels for the new name: The plot of the aria stems from a Persian tale of 1001 days which also relates to the standard motorisation of the Bugatti Veyron 16.4 with 1,001 hp. 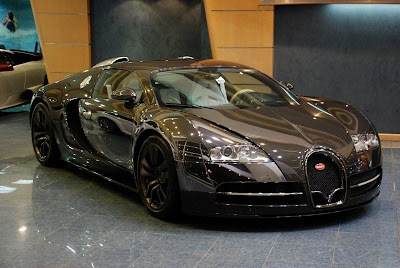 On the other hand, it should also refer to the origin of Kourosh Mansory, the founder and CEO of Mansory Corporation. And the opera has another reference to the offered product portfolio by ending after three acts. The LINEA Vincero edition is also not infinite – the project is strictly limited. It goes without saying that such a sonorous name is only suitable for an absolutely high-quality programme. 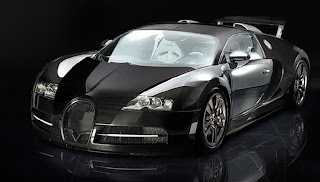 Already the Bugatti Veyron serial edition sets standards in terms of price, maximum speed and engine power and leaves its competitors far behind when a contender for the super sports car is to be crowned. Whoever now thinks that everything possible has been achieved, can be proved wrong. Already visually, the changes clearly show. The front part gets a comprehensive face-lift including modified wings, a shorter hood and a striking front apron. The LED daytime running lights integrated in the front mount and the implemented stylised “V” as a special tribute to the name “Vincero” draw even more attention to the car. 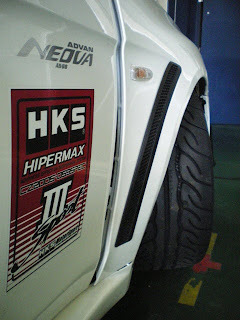 The newly developed side skirts are the visual and aerodynamic connection between the axles. 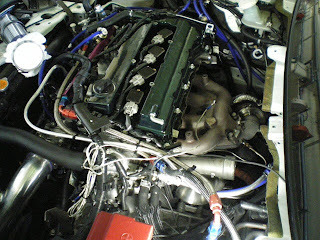 Larger air outlets at the sides and at the back render optimal engine cooling and in combination with the new diffuser, they underline the powerful car design. Mansory manufactures nearly all auto body parts from ultra-light and high-strength carbon. The applied hardening technique with strong pressure and high temperatures in the autoclave thereby enormously improve the material quality. In order to perfect the entire visual appearance, Mansory devised new, striking fully-forged turbine-design wheels for the Linea Vincero in serial dimensions. Also, the power engine is refined by Mansory. Technical innovation is combined with technical expertise and thereby, an increased cooling air supply and optimised exhaust system produce an unbelievable 1109 hp and 1310 Nm. The interior is exclusive and yet functional. Also here, Mansory understands how luxury and technology can be harmonically combined. When traditional craftsmanship, selected materials and stylish design merge, the result is an interior of automobile excellence. This mainly shows by the LED lights of the new Ambiente-Illumination-System which are fitted in the seats, door linings and the dashboard. The entire passenger compartment glows in a soft light which does not only render a comfortable feeling, but also emphasises the high-quality carbon applications and the especially grained leather. The ergonomically designed airbag steering wheel is both sportive and particularly pliable and is equipped with rocker switches. The Mansory individualisation programme for the Bugatti Veyron 16.4 is offered in a limited edition via the Middle East partner “Prestige Cars Abu Dhabi”. HKS has established the new HKS CZ200S Mitsubishi Lancer Evolution X as the successor to the outgoing HKS CT230R Circuit Time Attack Evo as its latest time attack vehicle. 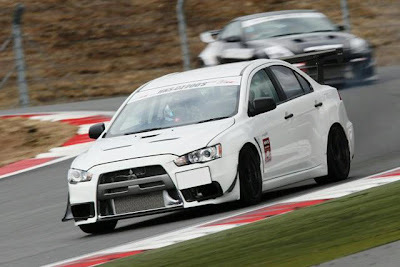 The CZ200S will be the basis where HKS will develop its complete parts line-up for the Mitsubishi Lancer Evolution X. 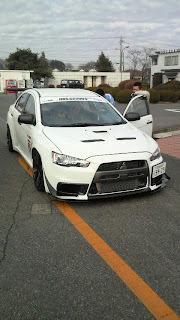 The CZ200S will be the basis in which HKS will develop its complete parts line-up for the Lancer Evolution X. Much like the development of products available for the previous generations of the Lancer Evolutions, the CZ200S utilizes currently available off-the-shelf and prototype HKS products. HKS prides itself in its engineering, motorsports development and manufacturing quality assuring customers that the same products that HKS sets records with are the same off-the-shelf products that a customer can expect from HKS. Working in conjunction with the Yokohama Tire Company, HKS plans on lap times under 1 minute at the famed Tsukuba Circuit. During initial testing of the new Advan Neova AD08 radial tires, the CZ200S posted a best lap time of 59.495 seconds at Tsukuba Circuit. MELBOURNE : February 27, 2009 - Toyota has unveiled two new locally developed show cars at the 2009 Melbourne Motor Show which feature cutting-edge customisation ideas from the booming modified street car scene. 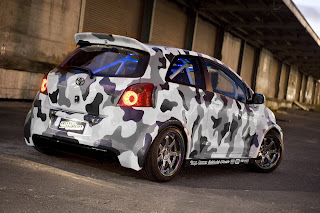 The highly modified Yaris and RAV4 are the result of collaboration with Australia’s leading promoter of street car shows and events, Auto Salon. “Basically, Toyota gave us the cars and told us to go crazy,” said project leader William Ng. The Auto Salon Yaris is distinguished by a camouflage paint-scheme and modified “double-wide” bodywork featuring guards which have been heavily flared to house over-sized 17-inch raised titanium lip wheels and 245/40 Michelin Pilot Preceda tyres. 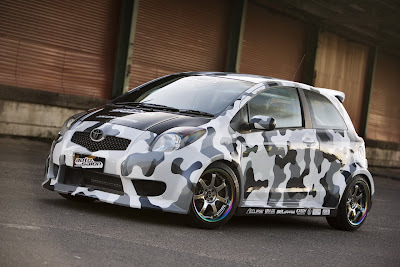 The Yaris’s suspension has been modified with the addition of Buddy Club coil-over suspension adjustable for ride and rebound. The interior of the Yaris has been enhanced with the addition of race-style TRD Recaro driver and front passenger seats, and a TRD instrument gauge cluster mounted on the steering column. The standard stereo has been replaced by an enormously powerful Fujitsu Eclipse sound system featuring four amplifiers and six sub-woofers. An unusual feature of the system is that the entire boot-mounted stereo sub-woofer assembly can be unbolted and removed. “Removing the sub-woofer lowers the kerb weight of the vehicle in order to enhance track-day performance,” said William Ng. 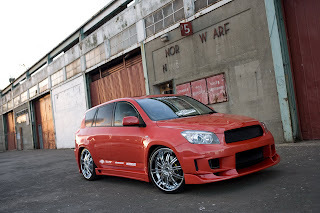 The Auto Salon RAV4 is a show standout thanks to its bright red pearlescent custom paint job and massive 22-inch wheels and tyres.A custom-built airbag suspension allows the RAV4 to be lowered on its wheels by up to 25 centimetres for display purposes and then raised again for driving. The custom look is completed by new front and rear bumper panels, deep side skirts and “shaved” external door handles - meaning they have been removed entirely and replaced by a remote control door opener. MARANELLO : February 27, 2009 – The 79th Geneva International Motor Show provides the venue for Ferrari to announce two new pieces of good news: the arrival of the sporty, dynamic Handling GT Evoluzione (HGTE) Package for the 599 GTB Fiorano and the world debut of the 599XX which is a technological laboratory aimed at a select group of clients. 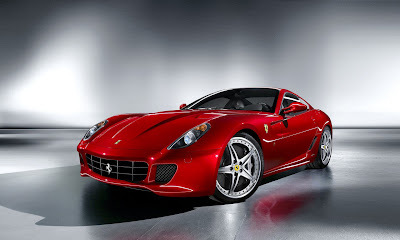 The latter new car incorporates the most advanced technologies resulting from Ferrari's road-going and F1 research. Many of the technological solutions it carries are being used for the first time and have been developed exclusively for this special car. The two new arrivals will be introduced to the international media by Ferrari Chairman Luca di Montezemolo on the opening day of the Show, March 3rd, at 10 am. 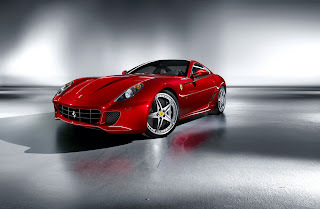 In addition to the 599 GTB Fiorano equipped with the Handling GTE package and finished in a new three-layer metallic Rosso, and the 599XX in a colour matching the F2008, Ferrari clients and enthusiasts will also be able to admire this single-seater that recently won the Prancing Horse its 16th Constructors' World title. On the stand there will also be the full range of Ferrari road cars: the Scuderia Spider 16M in a Grigio Titanio livery, the 430 Scuderia in Rosso Corsa and two Grand Tourer models, the Ferrari California in Nero Metallizzato with a Sabbia interior and the flagship 612 Scaglietti. The latter will be displayed in the Atelier, a dedicated area where owners can get a taste of the virtually endless personalisation options on offer to them. MLADA BOLSLAV, Czech Republic : February 27, 2009 - Skoda introduces the Fabia Sportline, new generation of sportline design elements, offered with 17" alloy wheels, projector headlight, lowering chassis, sport seats, leather steering wheel cover and stainless steel pedals. 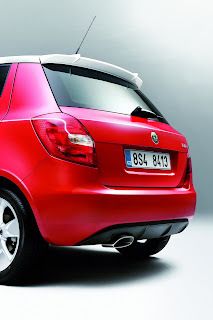 The new Fabia Sportline featured with 1.4 litre 63 kW to 1.6 litre 77 kW petrol engine and 1.4 litre TDI 56 kW to 1.9 litre TDI 77 kW diesel engine with 5-speed manaul transmission, the top model equipped with 6-speed Tiptronic automatic transmission. 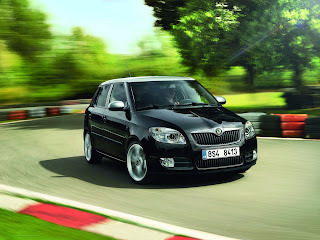 Model Fabia Sportline in the Czech Republic can be ordered from 1 March 2009 at all authorized dealers of Skoda. 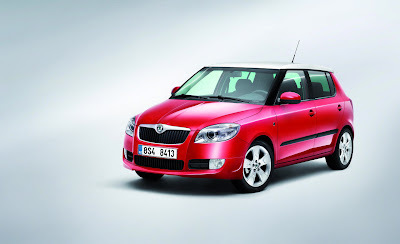 Price base model Fabia Sportline engine 1.4 16V/63kW and five-speed manual transmission is €11,800. TOKYO : February 27, 2009 - Nissan Motor Co. Ltd. and Nissan Motorsports International Co., Ltd. (NISMO) today announced their global motorsport programme for 2009. 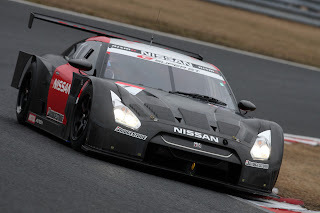 "Motorsports is an important part of Nissan's strategy for building a strong brand with consumers who share our passion for high-performance driving," said Carlos Tavares, Executive Vice President, Nissan Motor Co. Ltd. "In addition to being an important touch-point for consumers, motorsports serve as a dynamic proving ground for automotive innovation." 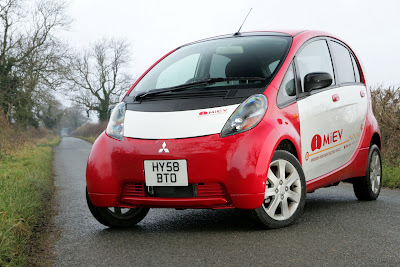 This year's entries will incorporate changes that include an improved air-cooling system and a paddle-shift transmission. The vehicles also conform to the racing body's latest regulation changes to decrease down force through shortened vehicle overhang. 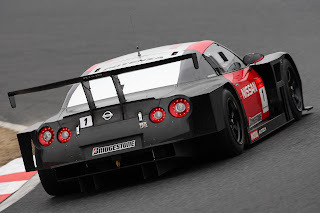 NISMO provides technical assistance and vehicle development to all participating teams. 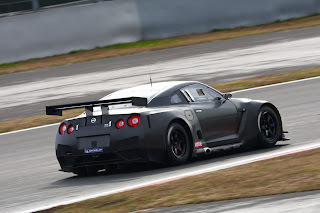 This year's line-up of NISMO, HASEMI MOTORSPORT, TEAM IMPUL and KONDO RACING will deploy 1 car each for a total of 4 Nissan GT-Rs that will race in the GT500 class series. Kunihiko Kakimoto remains as general manager in charge of Nissan related teams with the NISMO team managed by Yutaka Suzuki. HASEMI MOTOR SPORT team welcomes to its roster Hironobu Yasuda, who trained in the rigorous Nissan Driver Development Program (NDDP). 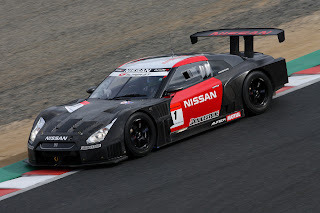 SUPER GT GT300 class - Technical assistance will be given to private teams competing in Fairlady Zs. Super Taikyu series - Technical assistance will be given to private teams competing in Fairlady Zs in both ST1 and ST3 classes. China - Aiming for a 3rd championship win, Nissan and NISMO will provide technical assistance to its China partner Dongfeng Motor Co., Ltd., which enters its Nissan Tiidas in the 1600cc Class of the China Circuit Championship (CCC). The event is the country's premier domestic racing event, where locally manufactured production-based race cars compete. Nissan Tiida won the title in 2006 and 2008. South Africa - With 8 consecutive Driver's championship wins, Nissan seeks to retain its title in the South Africa Off-Road Championship. 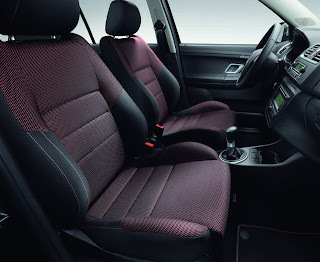 Dominating the event will be the Nissan Navara, well known for its controlled performance and rugged reliability. 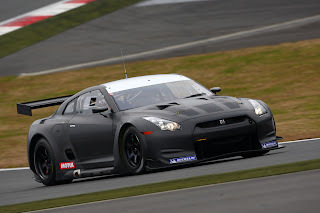 Europe - To check the performance of cars to be sold to racing teams competing in the FIA-GT1 class, a NISMO-developed car will run as a non-championship entry in 4 races in 2009, entered in a team partnership with Gigawave MotorSport. 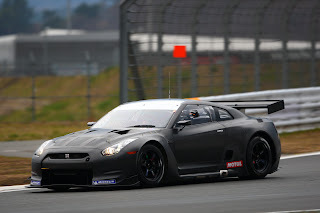 It is expected that the car is to be driven by Michael Krumm (NISMO) and Darren Turner (Gigawave). Gigawave MotorSport, a racing team based in county Essex, England, has been competing in the FIA GT Championship since 2007. The team's parent company Gigawave Ltd., as an official partner of the FIA GT Championship, provides on-board cameras for real-time coverage of the races.